HCL recently inroduced their new ME series Froyo tablet in Indian market, named HCL ME AM7-A1.The new HCL ME Tablet runs on Google Android Froyo 2.2 OS. The new HCL ME AM7-A1 Android Tablet equips a 7-inch capacitive multitouch display with 1024 x 600 pixel resolution and is powered with 800MHz high-performance Cortex A8 processor.The HCL ME tablet packs a 512MB DDR RAM and an offers 3G WCDMA via its SIM card slot. New HCL ME AM7-A1 Android Tablet Features 1.3 megapixel camera, 8GB internal memory, Wi-Fi 802.11 b/g, GPS with A-GPS support, Bluetooth 2.1 + EDR, full HD 1080p video playback @25fps, light sensor, 3.5mm stereo jack, USB 2.0 port, microphone, high quality speaker and a microSD card slot that support up to 16GB card. All new HCL ME Froyo Tablet is designed to work in HSDPA/UMTS 2100MHz and GSM/EDGE (850, 900, 1800, 1900 MHz) networks.The HCL tablet packs a 4200mAh Li polymer battery as the life provider.The talet weighs 300 grams and its dimensions are 197 x 126 x 13.8 mm. 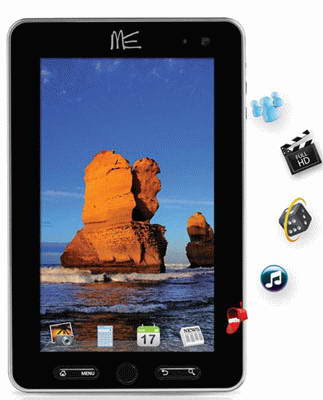 HCL ME AM7-A1 tablet now available in Indian market for a price tag of Rs. 22990. Tags:-HCL ME AM7-A1 Android Tablet, HCL ME Android Tablet,HCL ME Android Tablet price, india price of HCL ME Android Tablet, HCL ME Android Tablet india launch details, HCL ME Android Tablet release, HCL ME Android Tablet specs, HCL ME Android Tablet features, HCL ME Android Tablet memory, HCL ME Android Tablet price in india, HCL ME Android Tablet release, HCL ME Android Tablet launch.